We were pleased to present checks to the Long Island Greenbelt Trail Conference and the Center for Developmental Disabilities out of the proceeds of last year’s edition of Rob’s Run. Held in the memory of our friend Rob Lauterborn, Rob’s Run is a special event for many of us, so it is a special privilege to be able to make these donations to two such deserving organizations. The date for the 27th annual edition of Rob’s Run is Sunday, December 1st, so mark your calendars now for Long Island’s Premier Cross Country Race. On April 25th, we were please to present a check in the amount of $500 to Long Island Greenbelt Conference President David Reisfeld, out of the proceeds of last Fall;s Rob's Run. The check was presented to David by Co-Directors Sue Fitzpatrick and Jim Murray. GLIRC donated $2,500 to The Morgan Center located in Brightwaters. The Morgan Center is dedicated to providing preschool age children who are undergoing treatment for cancer the opportunity to interact and socialize in a safe environment. We donated $2,500 to Bay Shore Athletic Sponsors, whose mission is to provide conjunctive support to the interscholastic sports programs and student athletes of the Bay Shore School District. GLIRC members responded and donated nearly 1,000 shoes for Soles4Soles in March. 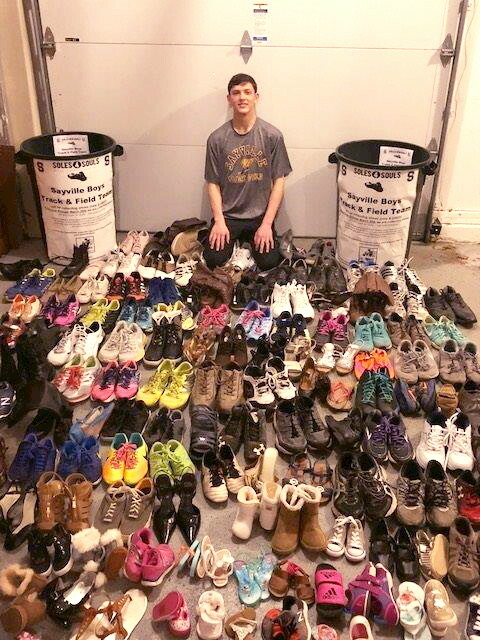 217 of those shoes came as a result of the efforts of Michael McKillop, a junior on the Sayville High School Track & Field Team, who organized a concerted effort in the Sayville Schools to support the Soles4Souls Drive. Donations from this year's race went to: $23,000 to BULA (Better Understanding of Life in Africa) and $2,000 donated by the Sayville Running Club to BULA; $2,500 donated to Patchogue-Medford Youth & Community Services and $2,500 donated to Seatuck Environmental Associaton. After the completion of Sayville Running Company 10 Mile Run, Mardi Gras Run, Kings Park 15K and Aspire 10K. Still to Come: David Lerner Associates Police Appreciation Run, Belmont Stakes 5K, Long Island Women's 5K, Heart & Sole 5K, Sands Point Sprint, Blazing Trails 4 Autism 4 Mile Run, the Town of Oyster Bay Supervisor's 5K, Suffolk County Marathon/Half Marathon/5K, and the Blue Ribbon 5K. Click here to see current standings.